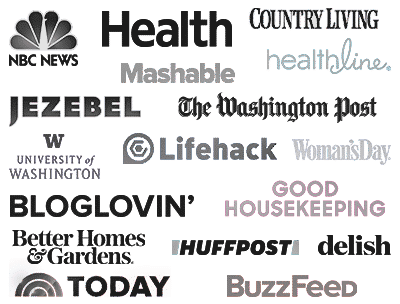 Crockpot Sweet and Tangy Asian Meatballs – if you like meatballs you’ll love these Asian style meatballs, they are sweet and tangy and made in a crockpot! 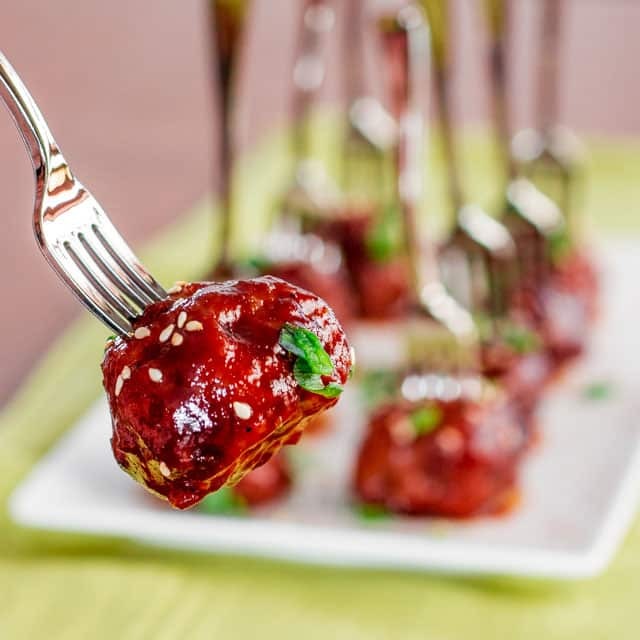 These crockpot sweet and tangy Asian meatballs are all about pork. I don’t know about you but I love pork meatballs. I love beef meatballs too, heck who am I kidding, I love all meatballs, but pork meatballs hold a special place in my heart. It’s probably because of the fat. 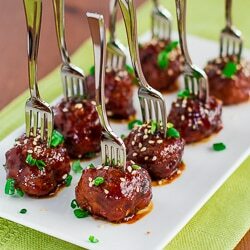 They are juicier than any other meatballs and pack a lot more flavor. But these meatballs here are super special. I loaded them up with lots of garlic, lots of green onions and ginger. A bit different from my usual meatball but special in its own right. I had leftover ground pork from Christmas, which I used to make my favorite cabbage rolls, but my husband bought like 6 lbs of ground pork, so what better way to use up all that ground pork than to make some yummy meatballs. The sauce here is to die for, it’s got hoisin sauce, Sriracha sauce, soy sauce, sesame oil, garlic, ginger, all my favorite Asian flavors in here, packed into one yummylicious sauce. I got a new crockpot for Christmas and I couldn’t wait to get in the kitchen and make something special with it. So to me, meatballs are pretty special. I did bake the meatballs for about 25 minutes at first at 400 F degrees, just because I wanted them to have a nice brown color, then in the crockpot they went for about 2 hours on low. 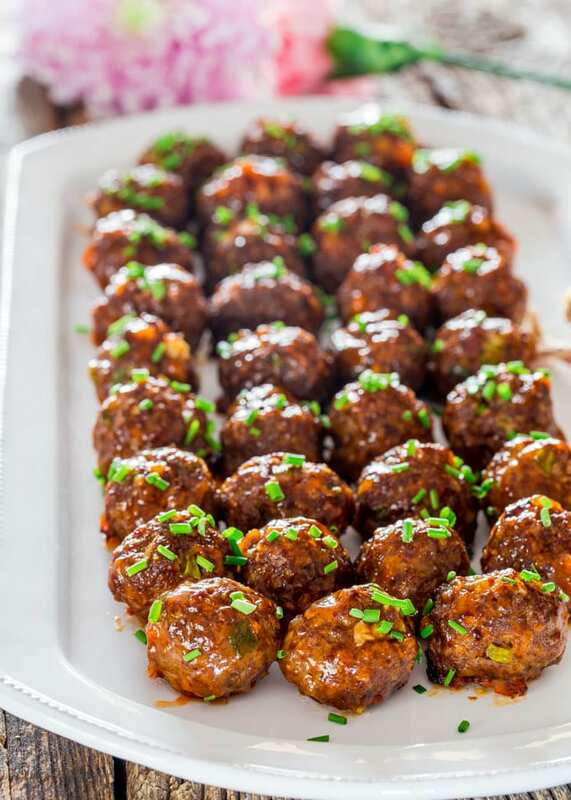 These Asian meatballs are the perfect appetizer for any party or potluck. They’re sweet from the hoisin sauce and they’re tangy and just a bit hot from the Sriracha sauce. These meatballs equal perfection! 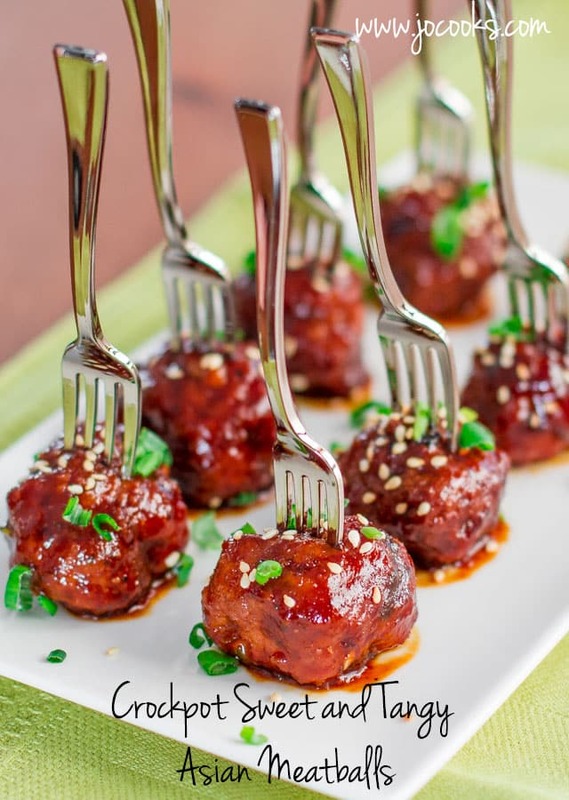 Crockpot Sweet and Tangy Asian Meatballs - if you like meatballs you'll love these Asian style meatballs, they are sweet and tangy and made in a crockpot! Mix all the meatball ingredients together in a large bowl. 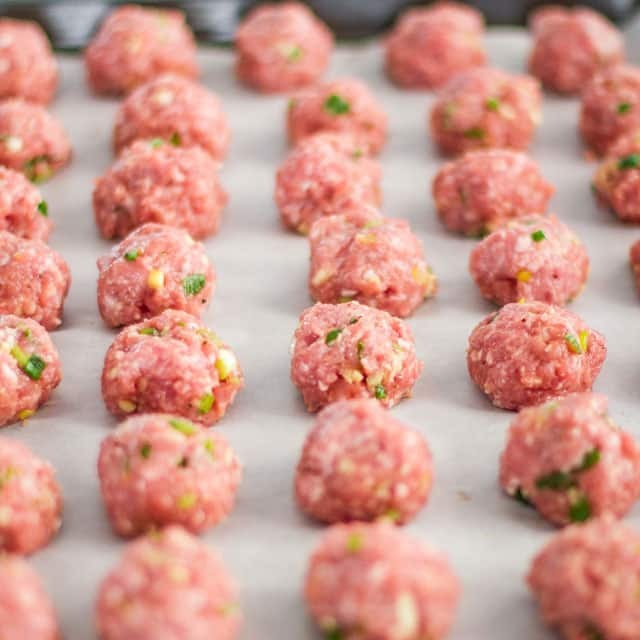 Shape into 1 inch in diameter meatballs and place them on the prepared baking sheet. 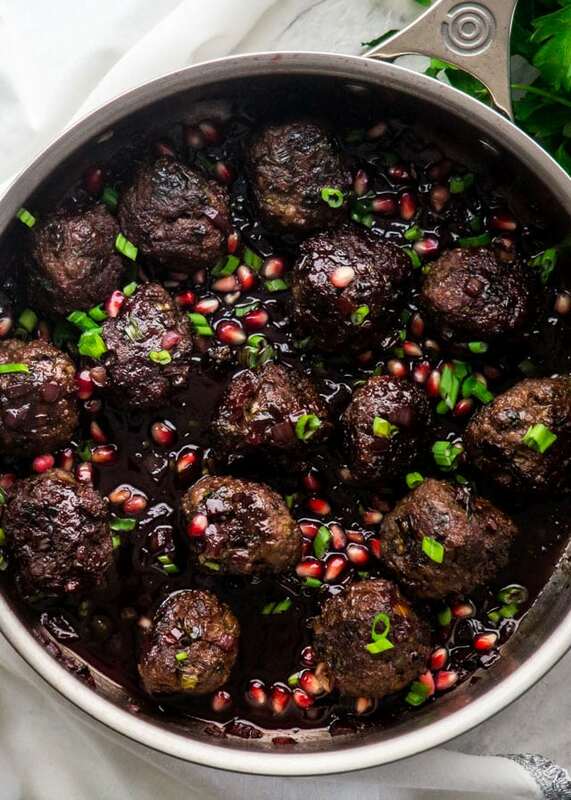 Bake the meatballs for 25 minutes or until just slight brown and no longer pink inside. In the meantime, mix all the sauce ingredients together. 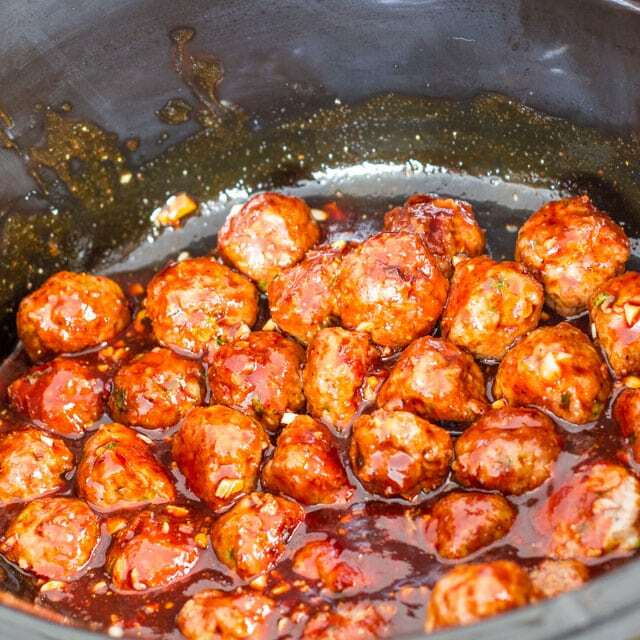 Toss the meatballs together with the sauce and pour into your crockpot. Cook on low for 2 hours. The sauce will reduce and thicken a bit. Serve garnished with additional chopped green onion or sesame seeds. This recipe should yield about 36 meatballs. Can I use any other type of meat: Any ground meat would work. Ground beef would be wonderful with this type of glaze, but feel free to use ground chicken or ground turkey. You can also combine meats like ground pork and ground beef together. Can I make these ahead: Yes! Meatballs usually reheat really well. If you're making these ahead, store the sauce separately in another container in the fridge. Before ready to serve place the frozen meatballs in the crockpot and pour the sauce over them. Cook on low for 4 hours or high for 2 hours. 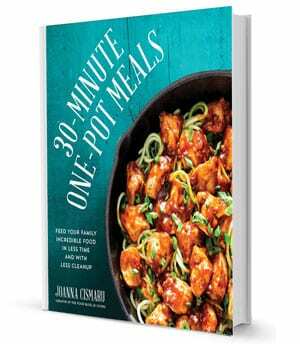 I can’t wait to try your Asian meatball recipes !!! They all look & sound amazing !!!! !